The damage to bodies was graphic. The damage to the nation's psyche will be deep. Patriots' Day is a holiday in Massachusetts, the day the Boston Marathon is run. At the end of the running of the race, there were explosions from two apparent bombs. 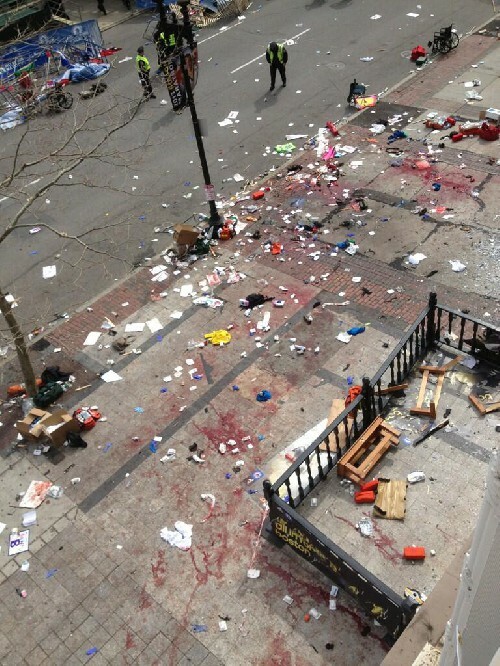 There are reports are of, at least, 176 injured, with three confirmed dead, one being an eight-year-old boy. Several people remain in ICU. Most of the injuries are to the lower limbs, and amputations have been made. 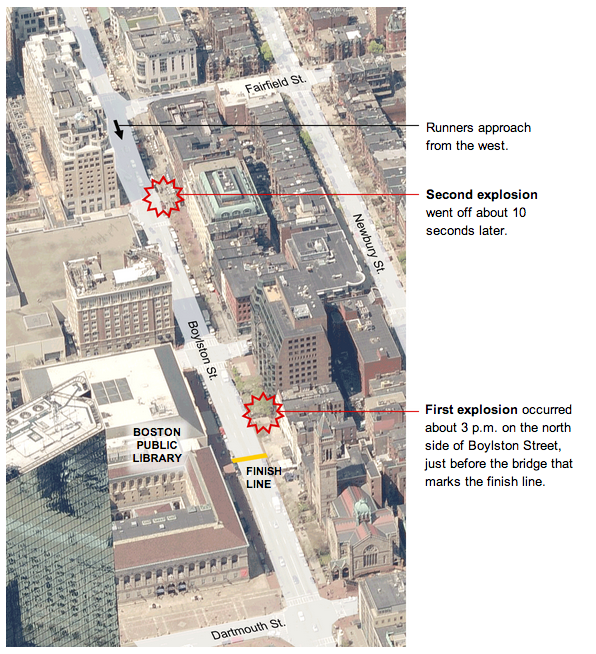 As this event unfolds, it cannot be ignored that there was a specific special time picked by the bomber or bombers. Spelled differently in Maine (e.g. Patriot's Day), the specific date of April 19th commemorates the anniversary of the Battles of Lexington and Concord, the first battles of the American Revolutionary War. Down through the years, the actual date has drifted to other days, as Patriots' Day is now observed on the third Monday in April in Massachusetts and Maine (once part of Massachusetts). Also, it is a public school observance day in Wisconsin. This year, therefore, Patriots' Day was celebrated on April 15th, which actually was not "Tax Day" in Massachusetts because citizens there get an extra day. As I already alerted readers here on April 9th, I was expecting some danger this week. This is a time of high violence dates of April 19 (Waco and Oklahoma City bombing anniversaries) and April 20 (Hitler's birthday and Columbine). April 19th is the anniversary of the deaths occurring at the end of the Waco events and the Oklahoma City bombing. It is an older anniversary of the Revolutionary War, of militia deaths, and past school violence incidents. 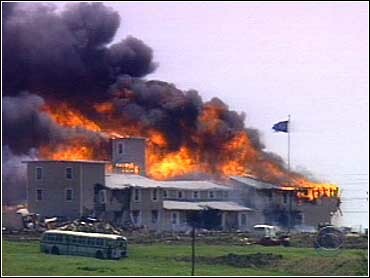 The Waco siege began on February 28, 1993, when the United States Bureau of Alcohol, Tobacco, and Firearms (ATF) attempted to execute a search warrant at the Branch Davidian ranch at Mount Carmel, a property located nine miles east-northeast of Waco, Texas. An exchange of gunfire resulted in the deaths of four agents and six followers of David Koresh. A subsequent 51-day siege by the Federal Bureau of Investigation ended on April 19th when fire destroyed the compound. Seventy-six people (24 of them British nationals) died in the fire, including more than 20 children, two pregnant women, and Koresh himself. The Oklahoma City bombing (OKBomb) was the bomb attack on the Alfred P. Murrah Federal Building in downtown Oklahoma City on April 19, 1995, when American militia movement sympathizer Timothy McVeigh allegedly detonated a truck filled with explosives parked in front of the building. McVeigh's co-conspirator, Terry Nichols, had assisted in the bomb preparation. Their motive allegedly was to avenge the government's handling of the Waco siege and Ruby Ridge incidents. There, too, is the Virginia Tech massacre, which was a school shooting that took place on April 16, 2007, on the campus of Virginia Polytechnic Institute and State University in Blacksburg, Virginia. A senior at Virginia Tech shot and killed 32 people and wounded 17 others in two separate attacks, approximately two hours apart, before dying by suicide. The “Patriot’s Day” holiday, the date the Revolutionary War began, now has links to a date holding symbolic importance around the nation. April 19th is historically significant. In 1943, the Nazis entered the Warsaw Ghetto, in 1993, the Waco raid occurred, and then in 1995, the Murrah Federal Building in Oklahoma City was bombed. This last event has also been tied to April 19, 1985; when 200 lawmen surrounded the Arkansas compound of the paramilitary Covenant, the Sword and the Arm. When the CSA surrendered four days later, authorities discovered that several members of The Order, the group accused of assassinating Denver radio talk-show host Alan Berg, were hiding at the CSA compound. Kerry Noble, who was second-in-command for the CSA, told The Denver Post "dates are so important in the movement. Everything has to have some kind of significance, either with the dates or numbers or something." One of the people who found particular significance in the April 19 date was white supremacist Richard Wayne Snell, who had been associated with the CSA. A decade earlier, he allegedly plotted to blow up the Murrah building. 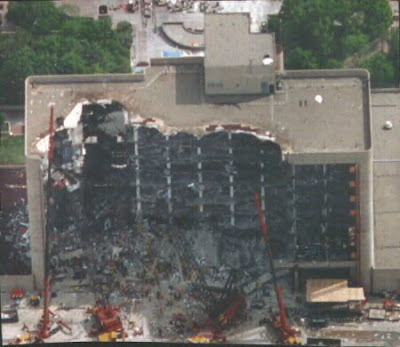 At three minutes past noon on April 19, 1995 -- three hours after the Oklahoma City blast -- Snell turned to a prison official as they watched live coverage of the Oklahoma City tragedy. According to the minute-by-minute log of Snell's last days on death row, Snell told the prison lieutenant that "today is a very significant day for various reasons." On April 19, 1995, Snell was executed in Arkansas. More notice should be taken of the special dates being chosen for these so-called "random" acts of violence and suicides, as there may be more of a link to the twilight meanings underlying them than originally envisioned. Sometimes the setting, the surrounding, and the site serve as that special little push that beguiles the copycat’s soul. Sometimes it’s the date. Usually it is a combination of the two. Some of the details of the attack are reminding people of the style of the bombings of Eric Rudolph too. Eric Robert Rudolph (born September 19, 1966), also known as the Olympic Park Bomber, is responsible for a series of bombings across the southern United States between 1996 and 1998, which killed two people and injured at least 150 others in the name of an anti-abortion and anti-gay agenda. The Federal Bureau of Investigation considers him a terrorist. As a teenager Rudolph was taken by his mother to a Church of Israel compound in 1984; it is connected to the Christian Identity movement. He has called himself a Roman Catholic in "the war to end this holocaust" (in reference to abortion). He has confirmed religious motivation, but denied racial motivation for his crimes. He was caught in 2003.Rudolph is best known as the perpetrator of Centennial Olympic Park bombing in Atlanta which occurred on July 27, 1996, during the 1996 Summer Olympics. 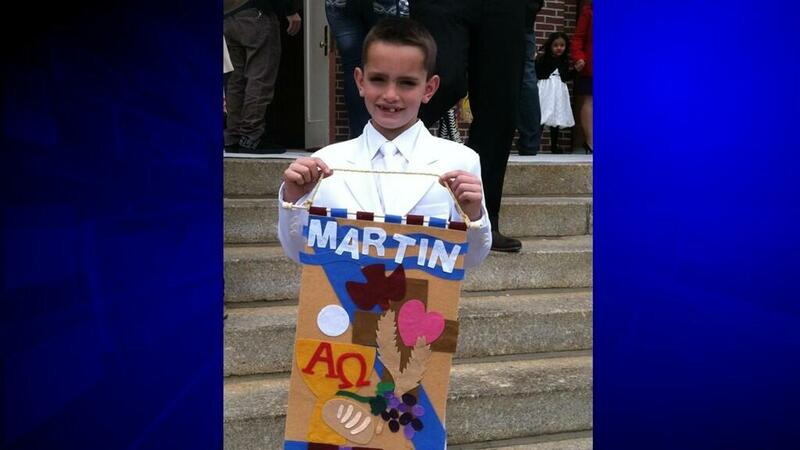 He called the police, warning about the bomb before it detonated. The blast killed spectator Alice Hawthorne and wounded 111 others. Melih Uzunyol, a Turkish cameraman who ran to the scene following the blast, died of a heart attack. Wikipedia. The technique of setting off one bomb, then moving people into danger where a second bomb would go off, was used by Rudolph. In 1997, two bombs were placed outside a women's clinic in the Atlanta suburb of Sandy Springs, going off an hour apart. Seven people were injured in the second blast, which investigators say they believe was designed to kill and injure law enforcement officers responding to the first bomb. Eric Rudolph has confessed to the bombings of an abortion clinic in the Atlanta suburb of Sandy Springs on January 16, 1997; the Otherside Lounge of Atlanta lesbian bar on February 21, 1997 (also using two bombs), injuring five; and an abortion clinic in Birmingham, Alabama on January 29, 1998, killing Birmingham police officer and part-time clinic security guard Robert Sanderson, and critically injuring nurse Emily Lyons. Rudolph's bombs were made of dynamite surrounded by nails, which acted as shrapnel. Don't be sidetracked by this date not being April 15th. It was on Patriots' Day. That is significant. As is the street, Boylston. Let us hope the suspect or suspects are captured soon. I would not be surprised to discover this is a home-grown event. Why the reports of a "dark-skinned" foreign national being sought? Why is there a New York Post's early report that a "Saudi National" is under arrest? 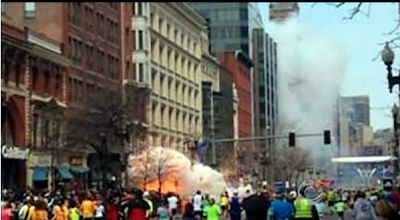 Law enforcement officials in Boston deny there is any truth to this rumor. Conflicting reports are that he is being merely questioned because he was tackled, running from the scene. Also, the search warrant in Revere has been tied to this alleged "person of interest's residence." This all sounds like the early reports after the OKBomb. At a news conference on Tuesday morning, Dr. George Velmahos, the chief of trauma surgery at Massachusetts General Hospital, said pellets and nails (many forms of shrapnel) had been removed from victims. 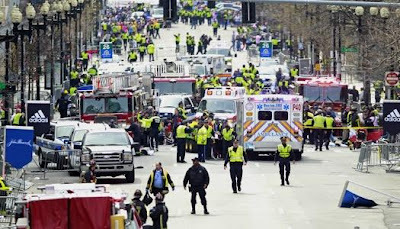 A second victim in the Boston Marathon bombings has been identified: Krystle M. Campbell, a 29-year-old from Medford, Mass. Her father, William A. Campbell Jr., told Yahoo News he's in shock that his daughter was killed. "My daughter was the most lovable girl. She helped everybody, and I'm just so shocked right now. We're just devastated," he said. "She was a wonderful, wonderful girl. Always willing to lend a hand." Campbell was at the finish line with a friend to cheer on her boyfriend, who was running the race. William Campbell said he doesn't know if her boyfriend finished the race before the bombs went off. More than 170 people were wounded—17 of them critically—and three were killed in the attacks. The other identified victim, 8-year-old Martin Richard, was running away from the first explosion with his family when the second blast killed him. His mother and 6-year-old sister were injured in the blast as well. 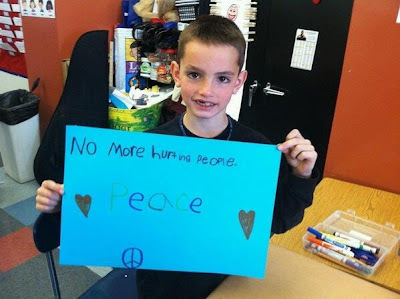 Martin Richard, above and below, was 8 years old. 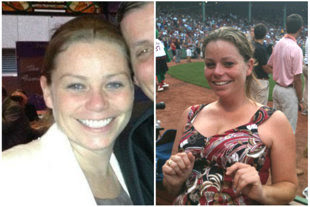 Krystle M. Campbell was 29. 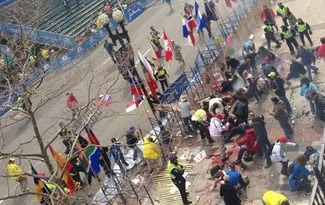 A Chinese citizen was killed in the Boston Marathon bombings, the Chinese consulate in New York said. The press release did not identify the woman. 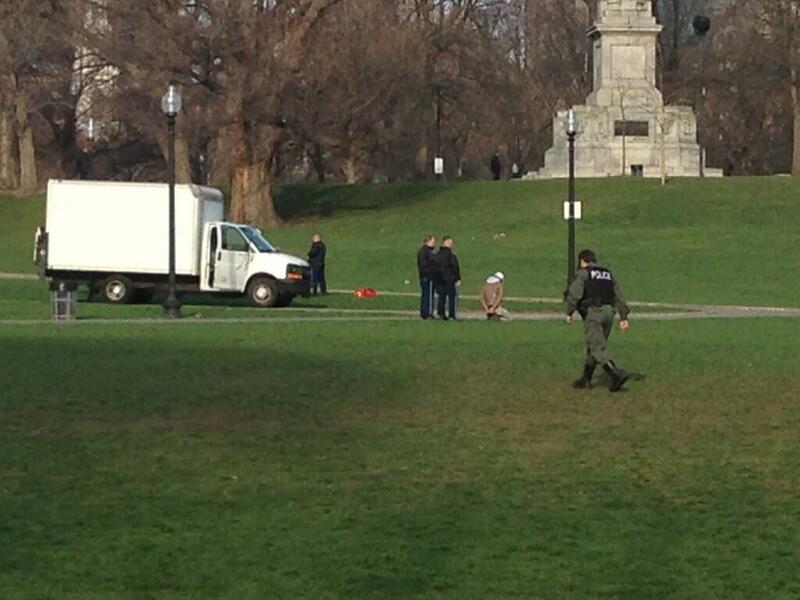 Boston University earlier confirmed that the person was a graduate student at the school. 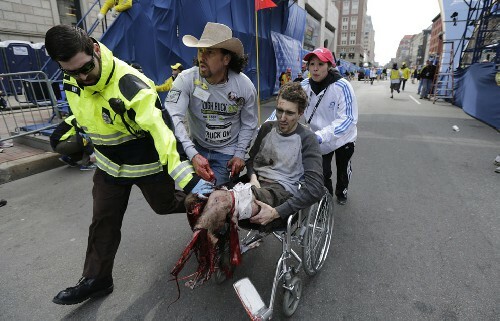 Carlos Arredondo, wearing the cowboy-style hat, helps a first responder run a severely injured man past the finish line following one of the Boston Marathon explosions. Arredondo was at the race to support five runners from Run for the Fallen Maine, an organization that honors soldiers who died overseas. Photo: Charles Krups. Bodies were torn apart. These events have human victims. We must never forget that. 42 is a big sync number here too,with Ford's new film "42" being released this month also. Worth noting that this is another "twins" event. Another tangential, odd "twins" link that passed this weekend was the Winklevoss twins' connection to Bitcoin (they own 10% of all Bitcoins; they are famous for claiming to be the originators of Facebook when they were enrolled at Harvard, another Massachusetts connection) and were the primary victims of the Bitcoin implosion. Paul Revere began his famous ride on April 18, 1775, and proceeded to warn the colonists of British troop movement. The following day saw the Battles of Lexington and Concord, which Patriots Day commemorates. Reports are now coming in of a search being conducted at a residence in Revere, MA as part of the bombing investigation. initiated for the first time on April 15, 2004, Jackie Robinson Day is celebrated each year on that day. Harrison Ford star of "Blade Runner"
Completely trivial synchronicity but when I got to work tonight at the local public library here in Dunedin New Zealand, the first book on the returns conveyor belt was training for marathons and the 2nd was history of the American revolution. The reports are of a Saudi national being "under guard" at a Boston area hospital. Under guard doesn't necessarily mean under arrest. That guard might very well be protecting someone who could have been the intended target of the bombs or is a foreign VIP injured in the blasts. The marathon is an international event. Harvard, in the Boston area, attracts students whose families are among the world's powerful. Therefore, the range of possibilities about the intent of these bombs is very large. We simply don't know enough to make any judgments about motives, targets, or perpetrators at this point. I wonder if this trend of mass killing events in mid/late April is some prelude to Walpurgisnacht, and if so, to whose benefit? Qadarullah is translated as "Will of Allah." Qadarullah is also noted as "the pre-existing outcome." I record that here to note the meaning of a comment maker's remark above. However, there is no evidence, at all, that this is an Islamic event. Every Major League Baseball player across the USA and Canada wore the number "42" on April 15, 2013, due to it being the anniversary of Jackie Robinson breaking the color barrier in professional baseball. "42" is also the Ultimate Answer To Everything in the Douglas Adams "Hitchhiker's Guide" books. It is almost easy to trivialize these tragedies, when people are maimed for life and lives are lost. And now we have a explosion in West Texas so close to the Waco anniversary at a fertilizer plant. What is going on? It is easy to trivialize these tragedies, and here we are just a day away from the Waco anniversary and this new tragedy in Texas at a fertilizer plant seems to sync with all these blogs as well.